Halloween is one of my all time favorite horror movies. What John Carpenter did with that movie is just incredible. He made a fantastic slasher film that encapsulates so much about not just the horror genre, but the Halloween holiday in general. It's a fun and scary movie, and I love it. I try to watch it every year on Halloween. So I've been very enthusiastic about this new film. I remember when it was first announced, with Stronger's David Gordon Green directing and co-writing with Danny McBride, and Jason Blum and Carpenter producing with Carpenter also doing the score. You can read that initial report here. They said that this new movie would be ignoring all of the other sequels, and would serve as a direct sequel to the original. I think that's a brilliant idea. The franchise has become rather convoluted, and trying to adhere to all of those movies would be pointless. So doing a proper sequel is rather enticing. There is so much potential in a sequel, especially with Jamie Lee Curtis back to reprise her leading role. 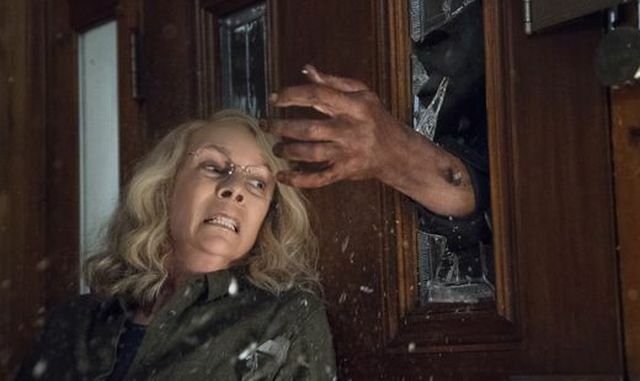 I have been so excited for this movie, and now we have our first trailer for Halloween, which opens in theaters on October 19. I have always been a little bit nervous that this movie wouldn't turn out to be that good, but any qualms I may have had immediately dissipated after watching this trailer. I absolutely love this trailer. It does a perfect job in giving us a glimpse of the story without giving away too much. I can tell you what this film is about, but I don't feel as if I know the entire plot. And the idea of Laurie (Curtis) training for years to be ready to kill Michael is an excellent premise. It's exactly where the sequel should go, and it gives their characters a tangible reason to cross paths again. They also do a great job in establishing the creepy atmosphere of the movie without showing us too many of the scares. I know exactly what kind of tone this movie is going for, but I don't feel as if everything has been spoiled. The opening sequence in the mental hospital perfectly sets up Michael Myers (Nick Castle), even for people who may not have seen the original. You know right off the bat that this is someone to fear, and that continues on throughout the trailer. My favorite part of the trailer is in the bathroom, when he drops the teeth in the stall. That really freaked me out, and I loved it. I feel like they have really nailed the tone. This is exactly the kind of movie this Halloween film should be, and I think it's really going to pay off once we see the actual movie. Overall, this trailer is perfect, and I cannot wait to see how Halloween turns out! What do you think? Did you like the first trailer for Halloween? Are you planning on seeing the film? Leave your thoughts in the comments section below.